Trying to figure out Hecaton. I tried a thing with Shelke entrusting to Relm while Bartz and Onion do damage, but I keep failing towards the end when Heck is moving so fast after a Savage Wrath that he does enough damage between Relm’s turns to kill people before she can fire off two Us in a row. Fielding two actual DPS will help, but make the initial turns nightmarish for healing, unless I sacrifice either Onion U or Alphy Chain for a few turns. Trying to use Tyro is a non-starter, because it means my DPS boost is Fabula Raider, which is erased by Savage Salvo. I should be able to find some path to victory. I mean, for god’s sake, I gave Bartz U1 and BWind, Luneth G and AO, Celes U, Gau U, Alphy Chain. I should be able to kill Heck somehow. Can someone explain how this glint works? Is it a wind aura? It seems to give half the damage boost that the bsb2 wind gives. It's a boost to elemental damage that stacks with aura. Cloud Glint? It hits six times instantly, grants EnWind, and if you already have EnWind, or refresh EnWind before it falls off, EnWind levels up to power level 2. If you do it again, it can go to power level 3 (the maximum). @enlong are you re hasting? So I need to glint and wind aura is what I’m hearing? Yeah. In my first team, Onion has meter to burn because of all the attacks. Hm. I should be using his B to cancel the salvo debuff. To get the benefit of both, yes. A large benefit of the glints is their reduced SB cost when being used in conjunction with ASBs. Early glint/spam elemental abilities/finish with strong ASB is a very common and reliable combo when going for a sub-30 magicite. What are your SBs for Cloud? Glint usb1 bsb2 OSB. Some uniques. Cloud doesn’t really have any good wind abilities to spam because he can’t dual cast the spell blade. I was going lifesiphonx2 usb bsb2 command2 usb span. Seems to do the most damage. Gets up to 60k a hit at times. Cloud’s Glint grants him a standard Enwind aura, as well as the buff that allows him to stack Wind Auras up to 3 times. The Wind auras can come from anywhere, meaning that if you use Cloud Cycle and Mako Power (in any order), their auras will stack. You may be experiencing more power gain from Cloud Cycle initially, because as a Burst, it also boosts all his stats for being in Burst Mode. However, the effect of stacked auras gets pretty significant. Enough that I’d venture using Mako Power twice would get you more power for the same meter as using Cloud Cycle once. Didn't you sub-30 it a few weeks ago? I thought you posted a picture of your clear. Yeah see if you can thread a Glint before the first USB1, then alternate BSB2 and USB1 as you get full SB bars. Don't bother with the OSB. Depending on your raw ATK score, you might be able to skip the BSB2 Command 2, and just spam Command 1 when you're not casting Soul Breaks. Oh, fair enough. Usual suspects would be Snow USB1, Squall USB2, Noel USB1, Laguna USB1. Didn't seem especially demanding, as far as Syldra clears go. If you do have AOSBs, maybe try something like that, but AOSB at the end of phase 2, and coast on Damage Reflect in phase 3. E: Also, Cold Offering next Wednesday. The glint is also instant cast, which is really nice for maxing out his DPS while under the USB1 EX mode. I think the main thing stopping me here is his absolute spam of de haste. USB: Ashe Glint dupe, Edward USB dupe. LMR: Rem LMR2 dupe, Galuf LMR, CoD USB. Galuf gets en-earth to start, that's good. CoD seems like a solid dark magic piece, with en-dark, party buff, and chase. Thinking either of my two white whales, Cloud USB1 or Orlandeau USB to pick. Cloud might help with Magicite right now, but I'm on the cusp of figuring out a team without him so not super necessary. Just stuff I've failed to pull all the time, ya know? Stacked auras do not increase damage all that much, especially if you have element boost weapon and armor and if you have a chain running. The burst has an ATK boost built in, and with the ATK caps relaxed, using the command for a second boost might well be worthwhile. The main value of the Glint for me is that it's instant cast and the damage per meter spent is decent, so getting the aura stacking as well is just a free bonus. The command 1 is very good for a burst command, but I don't think it's so good that it outperforms wind quadstrike, even factoring in that the command has a doublecast chance. How useful would kimahri's USB be without a chain? What’s the answer to this quiz? Decided I'm going to do USB select so did a draw. 1/11 disco Raines OSB. Meh. Not the worst OSB, but still. Hoo boy this is a bad situation. The way my current flow is going versus Heck, he's hitting me with his second Savage Quake right as Alphy needs to re-up his Chain, after he's spent 3 turns re-upping Haste and clearing away a pair of Blinds. I think I need to re-arrange my party so that I'm not getting two bad Blinds at once, and maybe even re-up his Chain early so that this timing doesn't line up so awfully. So I opened this up for the first time since ... uh. Since the first time they brought Omega back. They were just starting to release that oddball alt-leveling system involving crystals and the like, and IIRC they were just about to add a female version of Tyro? 2 years ago? I think? Which is sad because I was playing it religiously and and will never catch back up haha. And uh... Things changed. A lot. Apparently they redid the tutorial, and I got a shitload of item drops due to having done that years ago. Completely different main screen. What the heck is a Record Dungeon, Magicite, or Nightmare? The Nightmare is where you can get your first set of 6-star abilities. You might have already seen it if you were around when they were going to introduce a female Keeper. Regardless, there you fight a bunch of themed boss fights, followed by a super tough (for the time) fight that is more of a puzzle than a standard boss fight. There are two of these Nightmare dungeons each for the Combat, Black Magic, White Magic, Support, Summoning, and Celerity skill sets. The puzzle fights heavily encourage the use of the given skill type to properly interact with the gimmick. Beating one gets you a special crystal that can be used to create your one and only copy of a 6-star ability for that class. Once you have cleared all 12 Nightmare dungeons, you unlock the Magicite realm. This has been the highest of top-level difficulty content for the game since its introduction. This is also where the game introduces that female Keeper; her name is Elarra. The Magicite realm contains extremely deadly fights with bosses based heavily on all the Elemental types, except Poison. They started with 3-star Magicite bosses, and have only recently come close to finishing out the full complement of 5-stars. Each rank of Magicite bosses is that much more demanding than the tier below. And they heavily require use of the elements they're weak to. Anyway, this realm is where Tyro starts to discover some particularly dangerous paintings, and is introduced to both Elarra and some figures from elsewhere in the kingdom; outside of the Archives. 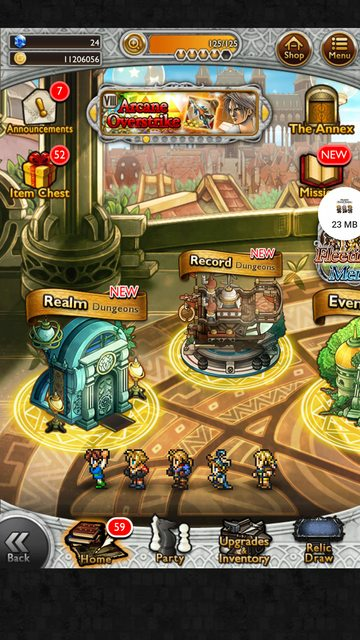 The Record Dungeons are, basically, FFRK's original story. It starts after the story told in the 3-star Magicite fights (but can be done regardless of progress there, so don't worry). Tyro and Elarra get called out to deal with some particularly odd paintings found on a chain of islands. When they enter these paintings, they don't just engage in the battles depicted by them, but they actually enter the story and are treated as characters native to that game's world for the duration. The record dungeons give you pre-set teams and basically ask you to figure out how best to use what you're given. Completing Record Dungeons rewards you with Crystal Water, which can be used to give a permanent boost to a character's stats. The Acolyte Archives are a set of completely-free banners that you can draw on once after completing certain tasks. AFter drawing on them, each one lets you select one relic from a specific pool of items. It's a nice way to get some specific gear. One of the banners even guarantees that you get Sentinel's Grimoire; so everyone has it now. By the way, you now get rewards for clearing up to 3 dungeons each. The first dungeon gives you gil, the second some Gysahl Greens, and the third a Mythril. Also, they improved the odds on the daily common relic draw. There's now something like a 10% chance to draw a 5-star relic. Which is a big jump over what it used to be, where you could go for something like a year without realistically getting even one hit. You might be a bit lost, but there's a ton of new content available outside of the weekly events. The tutorial rewards got reworked, and you can collect a ton of free relics (some very useful ones are available) for completing them. Record dungeons are basically a puzzle game - you fight in interactive cutscenes and pseudo-explorable dungeons of the main games, and you fight battles with preset characters and abilities. There's an overall storyline involving the RK characters. A lot of people really like them, since the winks and nods at FF lore are neat. 6* abilities have been released on a regular schedule, and they pretty much all beat out their 5* counterparts. There are some new skillsets, some with 6* abilities (Sharpshooter) and some without (Heavy Combat). The wombo combo-ness of Cloud's Ultra Soul Break 1 (with its break damage limit) has spread itself around - there are now abilities that can do the same (Heavy Combat's Stone Press, for example), as well as other SBs with that ability. We're about 2-3 weeks from the Kingdom Hearts 3 event, which promises to bring Global the next tier of SBs - Awakened Arcane SBs (AASB) are straight up "Now everyone is Cloud and Orlandeau, combined!" The Nightmare bosses give you 6* ability records that you can create and unlock (or have unlocked automatically, it's a terribly-designed system) on each character. The bosses have since been blown away by powercreep (you can literally solo some of them), so they introduced magicite bosses. These bosses give you summonable creatures that also carry passive and active effects, which can be combined and stacked to beef up your entire party, but they're almost all aimed at either boosting or defending against elemental damage (magicite bosses are also all elemental). Currently, we're getting 5* bosses released, but it started out at the 3* level. The other new things are the neo-Torment dungeons - while previously we had monthly Torment bosses with three phases and CMs, we now have permanent realm Torments with three levels of difficulty (240, 280, and ???). These new bosses don't have CMs, but they go from utter bastards to possible if you can stack your team with as many realm synergy characters as possible. Oh, there are also Mote dungeons, but those just give out some 4* motes (which are handed out like candy nowadays). OH, I remember that. I don't know if I got that far in it. Ah, so Magicite are the hardmode stuff. What do you get for doing them? I saw magicite listed under items and skills in the menu someplace... so I'm guessing you can do magicitie dungeons to get magicite drops? Can you farm Crystal Water, or are they a set amount? Or are they for specific characters? So I can roll on Book of Trials 1, 2, and 3? Hm. Anything specific I should aim for? Or will that depend on what characters I have unlocked? Oh god, the common relic draw was worthless back in the day. 10% is actually pretty reasonable. About 1 or 2 a month? Nice. What do you mean by 3 dungeons each? So dungeons are grouped into sets of 3? 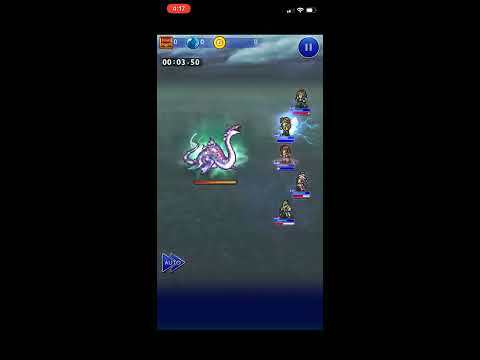 Not overthinking things, picked Elarra for the USB. Even with more Regenga on the way, Elarra's still real. good. Excellent skill set to go along with it. Anyone playing this on PC? I saw Andapp has it, but I don't know if it links up to English accounts. One of the hardmode things yeah - there's tiers of difficulty. Magicite drop magicite, which can be summoned (like an RW) and also give passive buffs to most every stat. Set amount, but not a ton and also they don't do much. You get a roll and you get a select. 1-3 mostly don't have anything useful, honestly. About one 6* a month, about one 5* a week, with the usual caveats about randomness. 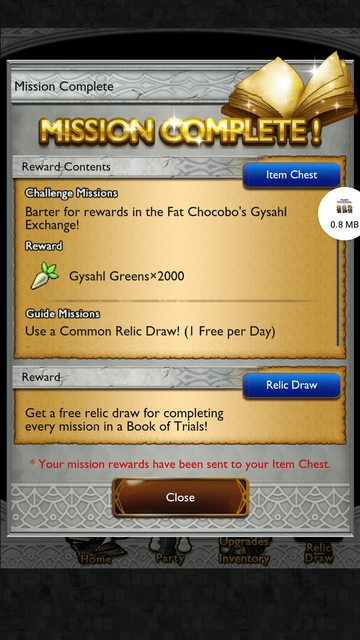 Just make sure to do 3 things a day to get the mythril. It's not 3 dungeons, it's 3 anything's. I’m thinking...possibly Mog for my USB? It’d only really help with torment, though, which I may be able to do without him. Three dungeons of any kind. 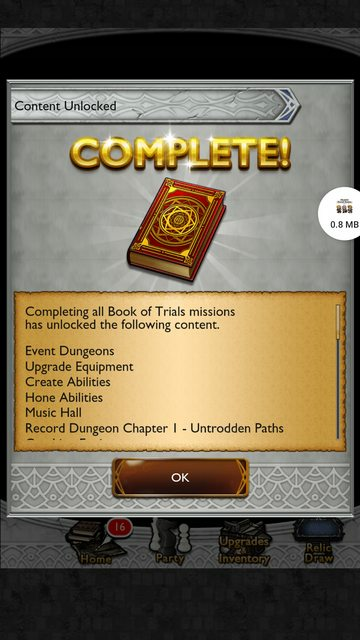 Definitely play through the record dungeons, there's a lot of free mythril in there. There's also a lot of stuff out there for completing a certain number of record dungeons. Don't feel bad about being behind, I've been playing for a long time and I'm still stuck on one of the nightmare bosses. Though hopefully we'll get one of those events where they go game by game and reopen all the events that have ever been so people can get their grind on and all the free eggs and mythril and abilities and stuff rather soon, because it sounds like you could clean up in them- I'd have no trouble pitching stam pots and even mythril at that kind of event, because the return will always be better than the investment (maybe two mythril per event for a return of seven or eight plus everything else the events drop). 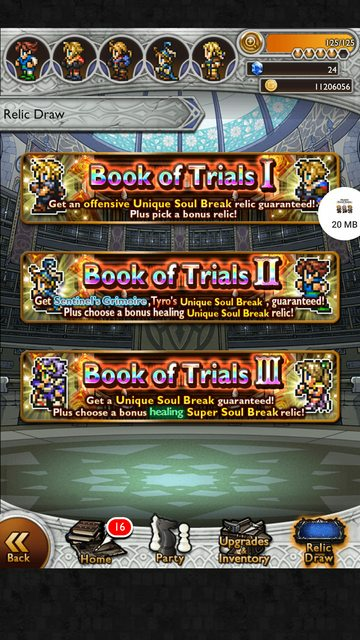 Oh, and one thing I don't think we mentioned was those book of trials things - there's 9 of them. You'll unlock more, and better ones, as you do more. You can look in...I think it's called the library, and it'll tell you what you need for the next b one. It's a good way to get an idea of what there is to do. Oh, do they do that often? I know a lot of the older mobile games around the era were pushing the "it'll never come back, give us money or you'll miss out" manipulation angle. That's good to know. Looks like the andapp version has keyboard shortcuts. Hm. Edit: Oh damn, it's JP only. Global can't use it. Do any of the Android Emulators still work?